Hey there. 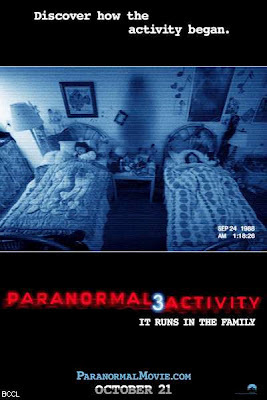 We recently checked out Paranormal Activity 3. The wife and I have seen the first two and I don't find them as frightening as my wife does. I remember her being spooked to the point where we needed to sleep with a light on for awhile. lol When it comes to horror films, I usually watch them by myself unless I can convince her to watch them with me. Needing a movie to check out, this was a great candidate for one to watch with the wife and kids. Yup... the kids. The film is rated R so you guys might want to check it out first before watching it with the preteens, but there really isn't anything going on but a lot of swear words. Since this is the third part of the series and the wife already knows what to expect (eerie noises, quick movements, and blank stares at the camera) I wasn't too worried that the film would be a little too much for the family. If you plan on seeing the film, don't read further. SPOILERS AHEAD. But if you've seen it and what to hear my take, read on. Here are my thoughts on... Paranormal Activity 3. First off, the third installment of the series is an "origins" type film. The first film explored the "demon" that haunted Katie and Micah. The second explored how the demon ended up attached to Katie. The third one attempted to explain how the demon, Toby, ended up in the family. Yup, the demon's name is Toby. I don't have anything against the name Toby, but I just would have thought that something that should be frightening would have a more menacing name. Then again, it could be it's "nice" name to appeal to the girls. Anyways, after about an hour of freaky noises and flying furniture, we finally get to what the film sets out to accomplish; the family deals with witchcraft. Yup, that's it and I must admit that it was kind of a let down. I don't mind going deeper into a back story. If done correctly, it can be awesome. Paranormal Activity 3 failed to delivery mainly because it stuck to the same formula that sucked audiences in for the first 2 films and hastily cut 15 mins of film in an attempt to piece it all together. You hear of the witchcraft involvement, you see a weird symbol or two, but you don't get the satisfaction of knowing what it all means. Is the grandmother the head which? Who called Toby into the family? Who initially started the whole first born thing? What's with the "I'll do what you want?" business? What was with the whole, "getting married to Toby" thing? I mean, I understand that they want to leave audiences wanting more but the last few minutes being rushed just didn't seem right. A lot of things are thrown at you at once instead of them being spread out throughout the film. It takes away the effectiveness of the plot when things are left unexplained. Believe it not, this was on of the more tense moments in the film. That's pretty much it. What else is there to say about this film? Things go bump in the night, the kids talk to a demon type entity, and there are some crazy stuff caught on film. Don't get me wrong, the film does have it's tense moments but those moments quickly dissolve when you realize that you've been down this road before. And it seems that we'll go down this path at least once more since Paramount Pictures have announced that Paranormal Activity 4 is in the works. I'll admit, I'll more than likely watch it. Not because I know it'll be good but because I want answers to what was left open. I guess that's the ploy that's being used to get audiences to go back for more. And you know what... it's working. Later!